The list below is what I jotted down just off the top of my head (I am no expert in opera, believe me, although I have seen my fair share—my dad is an opera encyclopedia). Posted on March 29, 2008 at 3:35 pm in Hindi movies	| RSS feed You can skip to the end and leave a reply. WOW! Rahul-bhai, you just have yet to see the right movie! Memsaab, I especially liked the part: “comic” side plots that aren’t really funny but waste a lot of time. Maybe that’s the “comic” part Rahul is talking about, which I agree is boring, but it’s the rest that’s so great. Fantastic list, Memsaab! 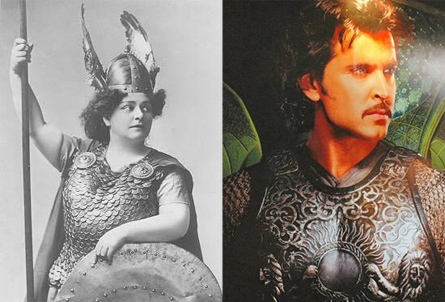 Hindi movies do have a lot in common with opera. The only things I’d add to your list: love at first sight; 3-hour plots that get wrapped up in the final 5 minutes; and evil characters must die or reform and be forgiven. that is why I love opera!! You must mention the super-fertility of the hero and heroine, especially on stormy nights and the hero’s going-away shortly after that – so operatic in scale.